Spin and Material. Experimental results conclusively indicate that polyester strings generate more spin than nylon strings. String Stiffness — How It Works. Stiffness is the most important thing you can know about a string. The material, construction, gauge, and tension are all elements of stiffness. The primary reason these are important is that they affect stiffness. How a string plays comes down to one basic thing — how stiff it is. 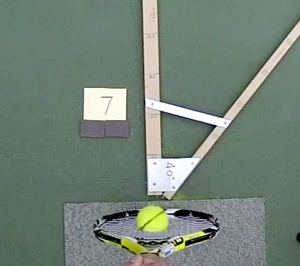 Stiffness is measured by how much a string stretches when it is quickly impacted, as in a tennis hit. The more it stretches, the softer it is, and the less it stretches, the stiffer it is (measured in units of how many pounds of force it takes to stretch the string one inch). This is known as dynamic stiffness because it is measured in a super quick impact (usually on the order of milliseconds). This is not the same thing as static stiffness, which you see when you simply pull on a string while stringing or hanging a weight on it. Just because a string is soft and stretchy when you pull on it does not mean it is soft when you hit it. Silly Putty is the classic example. If you slowly push on it, it flattens. But if you throw it against the wall, it bounces. It is soft at slow interactions and stiff at fast ones. A higher stiffness means more control, less power, and less comfort. Stiffer strings exhibit higher peak impact tension, higher peak force, less string deflection, and shorter dwell time (time on the strings). This leads to less power because the higher force crushes the ball more and loses energy. It leads to less comfort because the higher force for a shorter time creates greater shock to the hand and arm. And it creates more control because less time on the strings means less time for the force of ball impact to twist and turn the racquet's aim and also less time for the ball to take a ride on a racquet swing that is constantly changing the direction of its aim as it sweeps through both its horizontal and vertical arcs. The size of the arc sweep during the bounce duration affects the direction of the bounce. Just the opposite is true for softer string — there is more power because of less ball deformation, more comfort because lower forces spread out over longer time, and less control because longer dwell time leads to more arc sweep during the bounce. Longer dwell time does not, contrary to popular opinion, allow you time to direct the ball. In 4-7 ms of impact, you are a totally helpless victim of the physics of impact. In fact, your hand and brain don't even get the message that an impact has occurred until the ball has almost left the racquet — certainly too late to do anything about it. String stiffness is measured at a particular tension to show how one string compares to another under the same circumstances. In our tests, string stiffness is the measured value obtained by impacting one piece of string at a tension of 62 lbs. The results tell you, for example, that a string with a stiffness value of 220 lb/in is about 10% stiffer than one with a stiffness of 200 lb/in. But what will happen at other tensions? A string will have a different stiffness at every tension because the tension is contributing to the stiffness being measured. However, in the range of normal stringing tensions, the relative stiffness of one string to another will remain the same. A string that is stiffer than another at 62 lbs will also be stiffer at 50 lbs. But individual string stiffness is not the same as stringbed stiffness. The stringbed is made up of an entire pattern of interlacing strings. These strings may all be of the same material or a couple of different materials (such as gut in the mains and polyester in the crosses). Each string may be pulled to the same or different tensions (proportional stringing pulls each string to a tension proportional to its length). Each stringbed may have longer or shorter strings (based on headsize and shape) or greater or fewer number of strings (e.g., 16 by 18 vs. 16 by 19 pattern). And, due to both the passage of time and the number and intensity of hits, each stringbed may have lost different amounts of tension and thus overall stiffness. So, a stringbed is a very complicated creature. But one thing you do know — if you string your racquet with stiffer strings compared with softer strings at the same tension, your stringbed will be stiffer. You also know this — because power, control and comfort are all related to stiffness, if you string your racquet with a softer string, you will have more power, less control, and more comfort. A stiffer string will lead to less power, more control and less comfort. You also know one more very important thing. If the stringbed stiffness is the same for two same model racquets, they should feel and play the same. It does not matter how you get to a particular stringed stiffness — any combination of material, tension, gauge, and pattern that results in the same stringbed stiffness as another combination should perform the same. Stiffness is stiffness, period. And that is why the TW stiffness value (coming soon) is so important. More than any other thing when comparing strings, you know a string's likely effects on performance simply by knowing its stiffness compared to another. Why Do Players Disagree about Strings? These statements are true in a purely objective sense based on the property of the string. But you as an individual, interacting with a particular string, may have the opposite experience. For example, a stiff, less powerful string may cause you to swing harder, thus causing you to get more power. The string is less powerful, but your reaction to it is to create more power yourself. You do not necessarily know that you are doing this and may describe the string as "the most powerful string I have ever played with." Our tendency is to attribute to the string our perception of the consequences of our interaction with the string. Likewise, a stiff string contributes to a "truer" bounce because the ball will fly off in a direction closer to the aim of the racquet at the instant of impact. But whether you call this "control" or not may depend on whether your swing is always a little late or early at contact. It may be that although the string is "true," your interaction with it may not be, based on where you want the ball to land in the court. However, given time, your stroke may adapt so that physics, psychology, and goals all sync up again. So, knowing the stiffness of a string can tell you a lot about it compared to other strings. But it can't tell you what your experience will be. However, whatever that experience might be, it is likely that you will have the exact same experience with all other strings that are about the same stiffness (say, plus or minus 10 or 15 percent). If you like a string, you will like other strings similar to it in stiffness (regardless of all other properties about the string — material, construction, or gauge). Comparing strings based on stiffness is the only objective method available to compare strings and to formulate best-guess judgments as to what their innate performance properties are and how you might interact with those properties based on your past experiences with strings of known stiffness. Your subjective interaction with the objective facts is what is important. The objective stiffness measurement gives you an absolute baseline against which to measure your subjective perceptions. Your experience with a string of any given stiffness depends on what you are used to, your stroke, what you do in response to your perception of your experience, and how many days it has been since you had your racquet (or the demo you are using) strung. That last statement refers to tension loss. The stiffness of the string depends on its tension. And the tension of any string changes with every second of passing time and with every hit. As tension goes down, so does stiffness. The rate of tension loss is greatest when the racquet is first strung and for the next several hours and for the very first few hits. But after that it stabilizes to a near indiscernible rate, but a rate that adds up to considerable loss over a lot of time. So, the second most important thing to check about a string after its stiffness is its tension loss rate. If you string two racquets, one with String A and another with String B, which is a little bit stiffer than A but loses tension more quickly, tomorrow morning you may find that the racquet strung with String A actually plays stiffer. Then again, you may not notice the difference if they were within 10% of each other to begin with. You may not notice the difference for several days, if at all. What matters when you walk onto the court is the string stiffness you started with when you strung your racquet and the tension loss rate to get you to the stringbed stiffness you now have, and whether THAT is the stiffness you like to play with. TW's string testing data allow you to compare strings based on those crucial dimensions of string behavior.